Edit > Preferences > Behavior > Transforms > uncheck scale stroke width. If this does not fix the problem, you may have a problem with the document. I could recreate the problem/effect by applying a transformation to the current layer (using the xml editor). If such an transformation is the problem for you, there are two possible ways around it. Create a new layer (layer > add new layer. Or ctrl+shift+n) and draw only on the new layer. 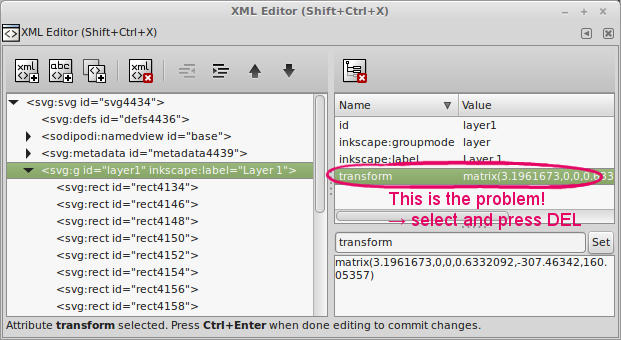 Open the xml editor (<>-icon in the toolbar. Or ctrl+shift+x). On the left, search for nodes like <svg:svg … or <svg:g …. Select such nodes and look for transform-attributes on the right-hand side. If there is a transform, select it and press DEL to delete it. Warning: This affects everything in the group. I've had that happen before, but usually only when I'd already created an object with a particular stroke, then converted it to a path, and then resized it using the object-resize handles. The fix for me was to just re-define the stroke width in the "Fill and Stroke" dialog. This solved it for me. I also prefer to not scale anything at all with transforms. So if you'd like that, you can disable that too in that preferences section. How to create a circular rainbow in Inkscape?